William Lyons Home, Inc. is a California-based, residential home builder. William Lyons, a former U.S. Air Force pilot, founded the company in 1954, then called Luxury Homes. In 1968, William Lyons Home sent Hymen Lake, a Central Florida real estate developer, a brochure of his California Classic model homes. Lake is best known as the developer of Sky Lake, a residential community and unincorporated area in located approximately seven miles south of Downtown Orlando between Lancaster Road and Sand Lake Road. The community was developed in late 1950s and 1960s, and it became one of the first housing developments to be racially integrated. The brochure highlights four model homes from the Huntington Series and list numerous options available with each model. Original brochure: Pine Castle Historical Society, Pine Castle, Florida. Digital reproduction of original brochure. "Letter from William Lyons Homes, Inc. to Hymen Lake (May 24, 1968)." RICHES of Central Florida. Originally created by William Lyons Home, Inc. Copyright to this resource is held by the William Lyons Home, Inc. and is provided here by RICHES of Central Florida for educational purposes only. Pfeifer, Stuart. "William Lyons lays the foundation for future growth." The Los Angeles Times, March 2, 2014. http://articles.latimes.com/2014/mar/02/business/la-fi-stock-spotlight-william-lyon-20140227. 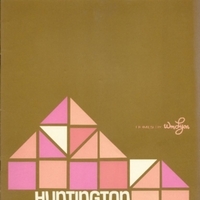 “California Classics: Homes by Wm Lyon: Huntington Series.” RICHES of Central Florida accessed April 22, 2019, https://richesmi.cah.ucf.edu/omeka/items/show/7008.